I thought you might want to see how the custom T-shirt thing works in real life. So I have a recent case-study for you. A friend of ours is a fervent Virginia Woolf and Marcel Proust fan. I know, she should probably be committed. But she’s not, she’s roaming the streets free and she recently celebrated her 50th birthday. Two friends invited to the party came along and briefed me for special, anniversary Tees. First I took into account her most prominent character traits: smart, kind, funny, giving, control freak. Sociable, loves holding court. Then her likes, dislikes & interests: coffee, smart phone games & literature addict, special feelings for Marcel and Virginia. Then came the harder part: figuring out concepts for the shirts. I researched Woolfe and Proust, flipped through my copies of “Mrs. Dalloway” and “A la recherche du temps perdu” (which brought back memories of Year 2 at UEA and struggling with the worst book I was ever required to read). A theme stuck. Stream of consciousness. Stream, stream….scream? 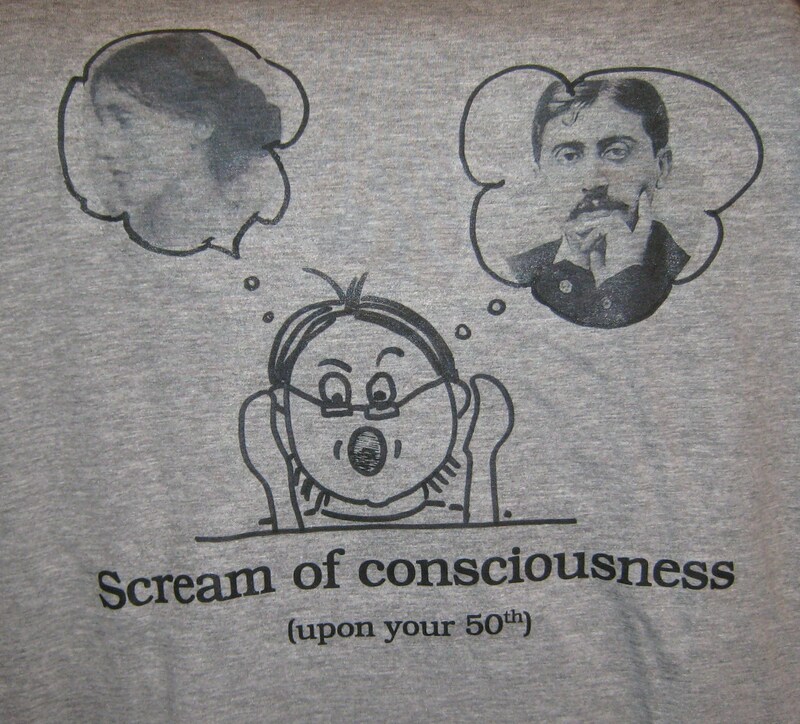 Scream of consciousness? Fully conscious of the fact that you are turning 50? Screaming? Hm…. Then the stunning, first line in Mrs. Dalloway: “Mrs. 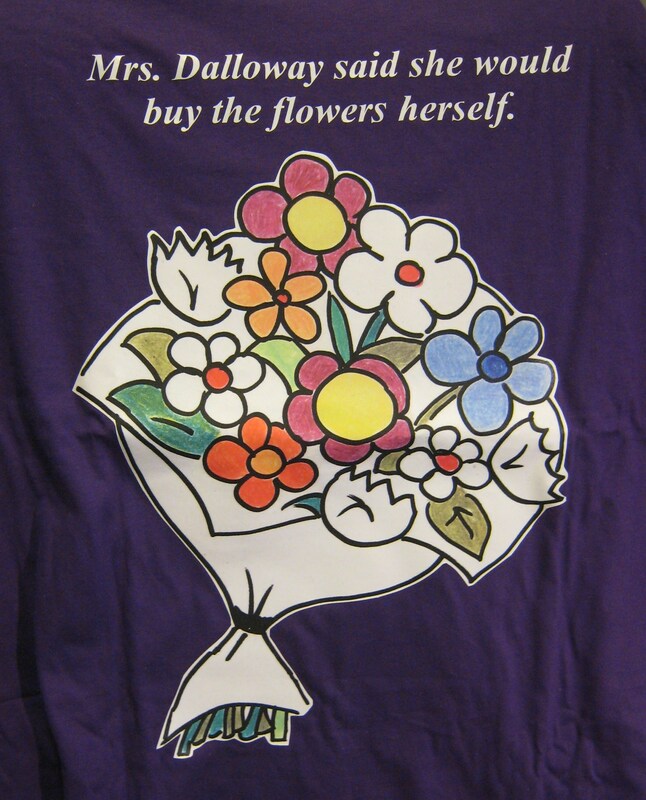 Dalloway said she would buy the flowers herself “. Typical. Just like our friend. Party organizer, control freak. A surprise party for her 50th an impossibility because of the latter. An interesting t-shirt, on the other hand, quite possible. That’s roughly how it works. A line, a thought, a hobby, a joke or a story kick-start the creative process and this usually results in a half-decent design. Fine art it’s not but it’s personal, thoughtful and pretty unique. Depending on the customer, a design that was originally made for a specific person can or cannot be repeated (with slight changes in colour, tagline etc). If allowed, then it can be found in the Xazamako shop (press Xazamako link in Blogroll). This entry was posted in design, fashion, friendship and tagged custom design, e-shop, T-shirts. Bookmark the permalink. romantic…at heart and in the soul. Always brings images of Merryl Streep in Michael Cunningham’s adaptation of The Hours….